With its fresh new look, the third edition of the Summit program helps develop confident English speakers who are able to navigate a host of social and professional situations. 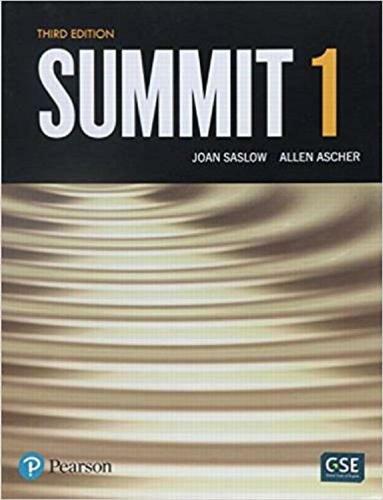 The two levels of Summit can be used with Top Notch as the fifth and sixth books in a complete six-level series. Summit 1 covers competencies from B2 to B2+ and Summit 2 introduces C1 competencies in the Common European Framework of Reference. The entire Summit course can be tailored to blended learning with its integrated online component, MyEnglishLab (access code available separately; not included in the Student Book). New Conversation Activator videos build communicative competence.New Discussion Activator videos increase range and depth of expression.Test-taking Skills Booster and extra challenge exercises help students succeed on the reading and listening sections of standardized tests.Greatly increased grammar, reading, listening, and writing practice plus digital grammar exercises give students the additional practice opportunities they've requested.Memorable models build natural, social language and conversation strategies.50+ listening tasks at each level develop critical thinking and crucial listening comprehension skills, such as listening for details, confirmation of content, inference, and understanding meaning.ActiveTeach includes a digital Student Book for whiteboards with lesson plans, assessment tools and access to audio, video, and exercises to make learning more focused and interactive.Fluency-building planning activities such as idea framing help students express themselves with confidence.More ready-to-use teacher resources (including a broad range of print and digital components) than other courses make Summit easy to use for busy teachers.